Gavros Plinius, an Imperial sorcerer, is a member of the order of the Synod, and can be found upon entering Mzulft during Revealing the Unseen. You will find Gavros in the very first room of Mzulft, heavily wounded and seemingly dying. His final words are: "Crystal.... gone... [coughing] Find... Paratus... in Oculory... After saying those final words, he dies. He wears blue mage robes and boots, and carries a research log as well as a key necessary to go further into the ruins. You will hear about the mysterious Synod when Arch-Mage Savos Aren points you towards Mirabelle Ervine for further information on the Staff of Magnus. When confronted, Mirabelle will admit why she told Savos about the staff: "I only brought it to his attention a few months back when the Synod showed up here looking for it. They were apparently under the impression we were keeping it in a closet somewhere." She will then elaborate on the Synod: "Mages based out of Cyrodiil. They fancy themselves the Imperial Authority on magic these last few hundred years. My understanding is that all they really do is make noise in an attempt to curry favor from the Emperor. Lots of politics, little magic. I was quite surprised to find them on our doorstep. They seemed amiable enough, but their line of questioning made me... uneasy. It became clear they're trying to hoard powerful artifacts, looking to consolidate power." When asked if anybody knows the location of the staff she will answer and point you towards Mzulft: "No one here does. The Synod seemed convinced it was somewhere in Skyrim. They inquired about the ruins of Mzulft, but that's all I remember. It sounded like they were heading there, though they were rather secretive about why. I suppose if you're intent on looking for the staff, there's a chance they might be in Mzulft yet. Just don't expect them to be cooperative." 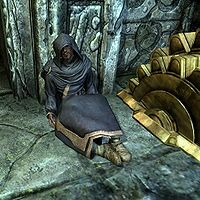 During your trek through Mzulft, you will find several deceased Synod researchers and, behind a locked door in the Mzulft Aedrome, his partner and fellow Synod member, Paratus Decimius, who has barricaded himself from the many Falmer occupants of Mzulft. When you approach the door, you will hear him whispering: "G...Gavros? Is that you? I'd almost given up hope. Let me get the door..." The door will then swing open and Paratus will immediately become suspicious: "What the... Who are you? Where's Gavros?" When you tell him what happened to his friend, he will say: "It was the Falmer, wasn't it? Curse them! They've ruined everything! If Gavros is gone, there's no hope. He was supposed to return with the crystal... Without that, all our efforts are wasted. And you. If you're here for treasure, or wisdom, or anything, I'm afraid you've wasted your time." When you tell him you are looking for the Synod, he will again mention Gavros: "And just why would you be doing that? Oh, it doesn't matter now. Gavros is never coming back, and he was supposed to have the crystal. Without that, we're lost. It's all been for nothing." He will then explain what the crystal is: "It didn't work the first time. I tried to tell Gavros, but he wouldn't listen. 'No, it won't be too cold' he said. Well, I was right, wasn't I? Focused completely wrong by the time we got here! The cold had warped it! Gavros had to cart it all the way back to Cyrodiil. Left the rest of us here to fend off the damnable Falmer." Lastly, he will prove very secretive about the Synod's presence in Mzulft: "It was a brilliant idea, really. Mostly mine, though Gavros took the credit. Secret, though. Official Synod business. Can't talk about it." When you hand him the crystal, he will forget about his deceased friend and walk you to the Oculory, never mentioning Gavros again. Gavros only shows up in Mzulft during the related quest, rendering Mzulft closed until the quest is initiated. This page was last modified on 28 February 2017, at 14:52.